The Ash is a ranch-style home that is striking for its elegant wood build, as well as its expansive but evenly spaced floor scheme. 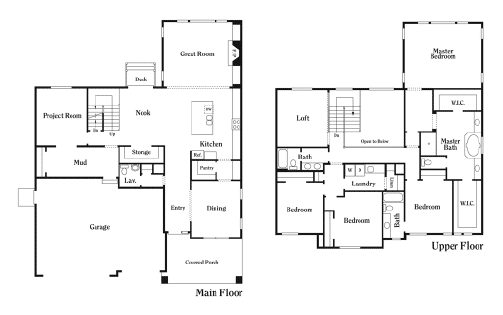 The house plan occupies a total area of 5,470 square feet, with the enclosed interiors comprising 3,580 feet when finished. The upper floor has a large master bedroom with a master’s bath and walk-in closet, as well as 3 bedrooms, 2 additional baths, a laundry room, and a loft. The main floor is host to a covered porch, deck, dining area, island kitchen with nook, lavatory, project room, and guest room. The garage can amply accommodate 3 cars. Your dream to live in a Utah home as exquisite as the Ash can easily come true with help from Perry Homes. With 40 years of home construction experience under our belts, we’ve made a name for ourselves in the Utah community. It’s due to our high-quality but fairly priced construction work, the value we set on customer consultation, and our commitment to doing things in a transparent, timely, and organized manner. We assign each client a design specialist to walk them through every important detail of the house construction, and our customer service team is ready to handle all follow-ups in the post-construction phase. To know more about the Ash and the way we’ll do things for you, give us a call at 801-264-8800 or submit your info on our Contact Us form. We’re excited to help you build your dream Utah home!